Closed corporate networks that connect a company’s branch offices, shops, hotels or restaurants to the main office have many benefits. Xfiber delivers closed corporate networks as a complete administrated service called IP/VPN. Xfiber handles all IP routing, and we remotely operate all necessary equipment located both centrally and with the customer. 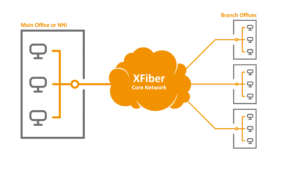 As an alternative to IP/VPN, Xfiber can deliver a closed corporate network as a pure Ethernet/Layer2 service. This can be a good choice for companies who want to administer IP routing and routers themselves.IP/VPN from Xfiber is a secure and scalable solution. By creating a dedicated virtual network without geographical constraints, users in a branch office can communicate securely with the company’s central services from other locations around the world, as if they were located at the same address. You can add, change, move and remove locations without this causing downtime for the other locations. A IP/VPN solution facilitates central operations. Only simple modems/routers need to be installed at each location, whereas all traffic administration takes place centrally. You can centralize all security solutions, including your firewall and antivirus, and make common rules. Many customers choose a net-centric firewall solution installed in Xfiber’s server rooms, so that the main office’s communications are not encumbered with internet traffic from its branch offices. You can also prioritise traffic that requires guaranteed bandwidth, such as IP telephony, video and Citrix access with Quality of Service solutions. It is easier to troubleshoot when all traffic management takes place centrally, and it is easier to send out replacement hardware, as these components require only a basic setup. Adapted for services such as Quality of Service (QoS), BBS/Nets, SOIL access, etc. As an alternative to IP/VPN, we can also supply closed corporate networks as pure Ethernet/Layer2 solutions. Some customers want to administer their own IP network and choose a pure Layer2 service from Xfiber. Then all accesses are delivered with pure Ethernet interfaces and customers can install routers themselves and establish their own security regime. n its simplest form, Ethernet Multiple Access connects 2 locations. Many companies choose to connect their 2 largest offices with a pure extension of their Ethernet-based LAN in a LAN2LAN solution. Contact us at 08095 or send inquiries to [email protected] Alternatively, you can use our contact form, and we will contact you for a presentation of our solutions.